Ranveer-Akshay episode of Koffee with Karan to feature Will Smith as well? The Enforcement Directorate (ED) on Wednesday issued a showcause notice to Pakistani Sufi singer Rahat Fateh Ali Khan under Foreign Exchange Management Act (FEMA). This is Khan's second brush with revenue intelligence agents. In 2011, the Directorate of Revenue Intelligence (DRI) had detained him at the Indira Gandhi International (IGI) airport in Delhi and slapped charges under FEMA and Customs Act violation against him for carrying a huge amount of undeclared foreign currency. 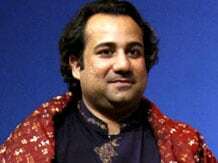 A renowned Sufi singer and nephew of Pakistani singing legend Ustad Nusrat Fateh Ali Khan, Rahat Fateh Ali Khan Khan debuted as a playback singer in Bollywood with the movie Paap in 2003. He has also served as a judge on singing reality shows in India.